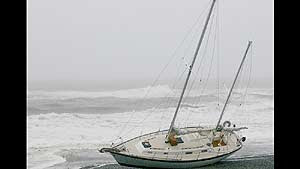 On May 2nd, Cal Watson in his sailboat the 'New Life', was run aground on the beach at Gold Beach, south of Coos Bay. He was sailing the boat to San Francisco to sell it. They informed us that he was heading out and we began praying for the journey. The storm that caught the boat was not supposed to be so big or come as quickly as it did. The GPS was not working as it should. Cal was caught off guard but it is apparent that God was in control. The people that came down to check it out said that was one spot on the beach that was not covered in big rocks. There is a very narrow way that is clear of boulders in the breakers and creates a smooth beach. One person said that it was simply a miracle that he did not hit any of the rocks on either side. As you can see in the picture, the boat seems to have just glided onto the sand. Cal is completely unhurt and there is very little damage to the boat. This link will take you to the newspaper website reporting about it in 'The World' - a local newspaper.